Dynamic Flights Gymnastics is a USA Gymnastics Member Club and we support the guidelines set forth by the organization. 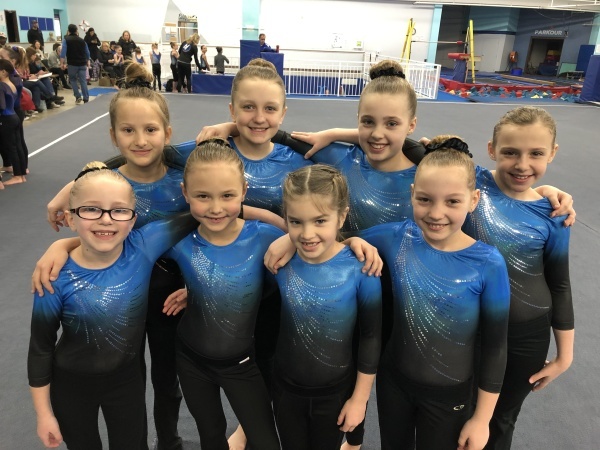 Our Team Track classes (Starlettes, Dynamos, and Preteam) are three pre-competition classes that prepare your gymnast for our competition teams. We participate in the Xcel Gymnastics Program through USAG. There are five levels in the program. We place your gymnast at the appropriate level. Our Starlettes class is for small but mighty gymnasts who are ready for the next level. In this class, gymnasts will focus on form while learning fundamental gymnastics skills. Gymnasts will also develop motor skills, strength, flexibility, balance, and confidence! Our Dynamos class is for beginner-level gymnasts who are looking to track towards competition gymnastics. In this class, gymnasts will work on developing fundamental gymnastics skills. The class is focused on developing proper form, strength, and flexibility that will help them succeed in the future. Our Pre-Team class will prepare gymnasts for their first season of competitive gymnastics. Gymnasts in this class will learn routines on each event and participate in two competitions. This class is focused on form and execution.